In our opinion when it comes to choosing a base vehicle, there are only two choices… The class-leading Mercedes Sprinter and Volkswagen Crafter. From here there are two routes, New or pre-owned. Pre-Owned Route: Not everybody requires a new vehicle for conversion. If u wish to use a pre-owned vehicle for conversion you must supply. Unfortunately we cannot source pre-owned vehicles on your behalf, however, we are always available for advice on purchasing used vehicles. New Route: Take advantage of our excellent links with Mercedes-Benz and VW and purchase a new base vehicle through us with excellent rates. If you prefer, you can supply your own new vehicle for conversion. All new Mclaren supplied Mercedes vehicles come with 3 years unlimited mileage warranty, Mobilo Roadside Assistance, 163BHP, Air Conditioning, Cruise Control, factory swivel comfort seats with electric handbrake, 7″ Multismartphonem and smart phone connectivity. 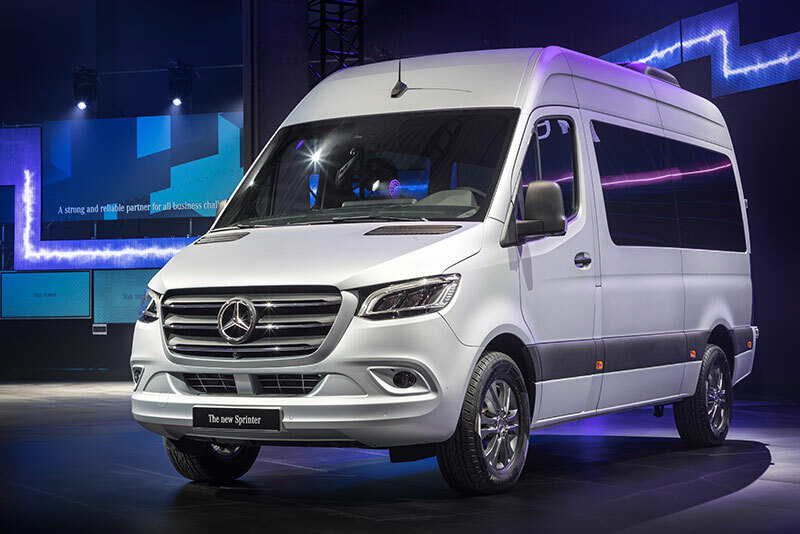 The new Sprinter features many safety features as standard including Crosswind Assist, ESP, Attention Assist and Autonomous Emergency Braking. There is also a vast array of options available including 3.0 V6 190BHP, Performance LED Headlights, Metallic Paint, 10″ Multimedia System, Electric and Heated Seats, Electric sliding side door, 7 speed Automatic transmission, Reverse Camera, 360 Parking package, parking sensors and even an AWD option. Optional Safety Features include Blind Spot Assist, Active Lane Keeping Assist and Traffic Sign Recognition. Up to date Sprinter brochure available on request. All new Mclaren supplied Volkswagen vehicles come with 3 years unlimited mileage warranty, VW Roadside Assistance, 140BHP, Air Conditioning, Cruise Control, factory swivel seats, 8″ Multimedia System and smartphone connectivity. There is also a vast array of options available including a 177BHP engine, LED Headlights, Metallic and Pearlescent Paint, Heated Seats, 8-speed Automatic transmission, Reverse Camera, parking sensors and even 4 Motion. Up to date Crafter brochure available on request.